A recent Canine Corner post by Dr. Stanley Coren, a well-known writer on canine cognition strongly suggests that they are not. I’d like to present an opposing view of this often contentious question. Full disclosure: I feed Cali a partially raw diet; I did the same for Jana for several years and she thrived on it. Cali’s sister Dora recently added raw food to her diet, and she’s healthier and more energetic than I have ever seen her. Other dogs I know have had similar experiences. So, with some caveats, I favor raw or partially raw diets. How’s that for hedging my bets? I have a lot of respect for Dr. Coren; I’ve read most of his (copious) work on canine intelligence and relationships with people; I’ve even taken a graduate seminar with him. He’s a psychologist, though; not a nutritionist, so I am skeptical of his advice on canine nutrition. His column starts with a terrible story about someone who fed raw until her child got salmonella; he then goes into detail about why many veterinarians recommend against raw diets and how the people who feed raw diets tend not to trust vets. I have no idea if the statistics he quotes are accurate or representative. But it doesn’t really matter. I go to my veterinarian, as I go to a doctor, for medical advice, diagnosis and treatment of medical problems. Just as my doctor might advise me to lose weight or warn that my weight could cause health problems, I’d expect my vet to warn me if my dog were severely overweight. 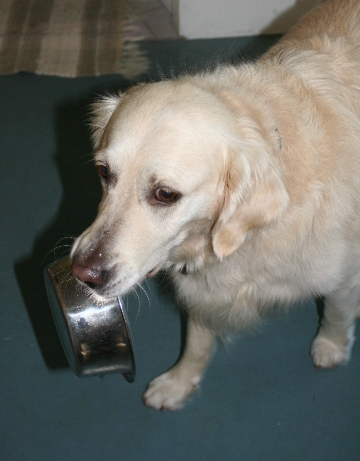 (If my golden retriever were underweight, I’d already know there was a problem!) If a medical condition indicated a particular dietary restriction, I’d expect the vet to tell me that, too. But if I needed more detailed diet advice, I’d go to a dietician, not my internist. Similarly, when I seek nutrition information for my dogs, I look to experts who specialize in canine diet and nutrition. In most cases, that is not the vet. Surprised? Just as vets are the wrong address for questions on behavior and training, the vet is not the best source of information on canine diet. Of course, just as some vets are also certified companion animal behaviorists, some take an interest in nutrition and become experts, even board-certified nutritionists. But these are the exception. And the nutrition courses that vet schools offer are unlikely to focus intensely on canine nutrition; vets learn to treat many species of pet and farm animals. I’m fortunate that one of Cali’s vets has taken a deep interest in canine nutrition and has continued to study nutrition and new research throughout her career. This vet firmly believes in and advocates a raw diet for dogs. She urges low-carb diets, too, and, since most kibbles have a lot of carbs, she’s not a huge fan of kibble. She argues, convincingly, that fresh, real food is far more healthful, and, based on dogs’ ancestry, a more natural diet for dogs than hyper-processed cooked kibble. Another source of in-depth information about canine diet is The Whole Dog Journal. It takes no advertising, so is not beholden in any way to pet food companies. This is markedly different from the average vet, who sells (and profits from) so-called “prescription” diets and who may also push a particular line of foods for all their clients. The Whole Dog Journal publishes detailed reviews of canned, dry, and dehydrated raw dog foods every year. It has published several articles exploring the pros and cons of raw diets as well. (See: Raw Dog Food and Salmonella Risks and High Pressure Processing and Your Dog’s Raw Food, for example.) When evaluating commercial foods, WDJ asks probing questions of the manufacturer; it has a fairly high bar for including a company in its list of acceptable or recommended foods. I’ve said it before: If you don’t subscribe to The Whole Dog Journal, you should! Recently, a nutritionist who works with Deni’s guide dog school recommended a raw diet for Koala, Deni’s guide. Koala has “leaky gut,” and the nutritionist said that the raw diet was easier for her to digest than kibble and would allow her gut to heal. I found that interesting because one of my hesitations with raw diet was that I thought it was recommended only for dogs with a healthy digestive system. But Koala is doing very well; she has not had any of the issues — vomiting, stomach upset, etc. — that she had consistently on a kibble diet. I still would be very careful about introducing a raw diet to a dog with a compromised immune system, but I think it is a healthful and desirable option for most dogs. What is my other area of concern? Well, the story that Dr. Coren based his blog post on illustrates it nicely: safe handling. The woman in the story let her young son feed the dog, handling the raw food. I don’t eat meat or seafood, but when I did, I would not have trusted a child to handle and prepare it safely or to thoroughly clean the utensils that had been in contact with it. Similarly, I would not let a young child feed Cali her raw food or do the cleanup. I wash everything carefully, just as I would with raw meat if I were cooking that for myself. It seems like common sense. But if I had young children in the house, I probably would avoid a raw diet just because it would be harder to enforce the safe handling protocols. So, all that is a long lead up to this: I think that raw diets are perfectly safe if handled with proper care. The presence of Salmonella in some samples does not worry me; eggs and chicken commonly carry some Salmonella. Many dogs “shed” Salmonella and other pathogens in their feces; that is not an indication that they are sick and most never have symptoms. But it is an argument for picking up your yard often — and washing your hands afterward. Dry foods have more recalls for Salmonella contamination than raw dog foods, though that might just be a question of volume. Lots more dry food is out there than raw! The bottom line is, we eat food — as do our dogs — from an imperfect system that exists in a world full of germs and pathogens. We therefore should take precautions with all of our food. A raw diet has many, many benefits for dogs, and, if you can afford it and handle it safely, it is something that I think is worth considering.